Every girl (or guy) needs a few company recipes that look and taste impressive but can be put together in well under an hour and without, you guessed it, neuroses-inducing stress. Today, I am sharing one of my go-tos for last minute entertaining. This Asian-inflected entree works well if you are looking for a universally likable seafood dish. A summer-ready recipe, the Tuna can be prepared on the grill (or indoor grill pan) while the Caramel glaze comes together quickly on the stove top. Today's recipe is only lightly adapted from none other than my fave gal, Martha, and is easily accessorized with quick additions like sesame rice, some wasabi micro-green garnish (as shown), or even some pickled Daikon if you have a day's notice. Click Here for my favorite Daikon and Carrot Pickles Recipe - a great side for this dish. Make the Miso-Shallot Caramel by placing Sugar and 2-3 tablespoons of water in a small saucepan. Cook over medium-high heat until the sugar is dissolved and turns amber in color - about 10 minutes. Add Shallots to the sugar mixture and toss to coat. Cook, stirring, until Caramel turns back into a liquid state again, about 1-2 minutes. Add Miso, Soy Sauce, Worcestershire, and Marsala Wine and stir to combine. Reduce heat to medium and stir until syrupy, about 8 minutes. Remove from the heat and transfer the mixture to a heat proof bowl. Heat up your grill or grill pan until very hot. While heating, season your Tuna Steaks with Salt and Pepper on both sides. 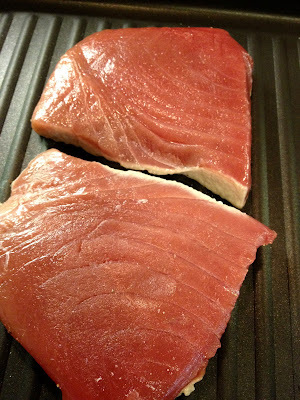 Place Tuna Steaks on a hot grill and cook on one side for 2 minutes, until browned. Turn over and cook on the other side for 1 to 2 minutes more. Remove to a large cutting board and immediately brush with Miso Caramel on tops and sides. Slice each Tuna Steak diagonally into pieces of your desired size. Garnish with Sesame Seeds and serve. 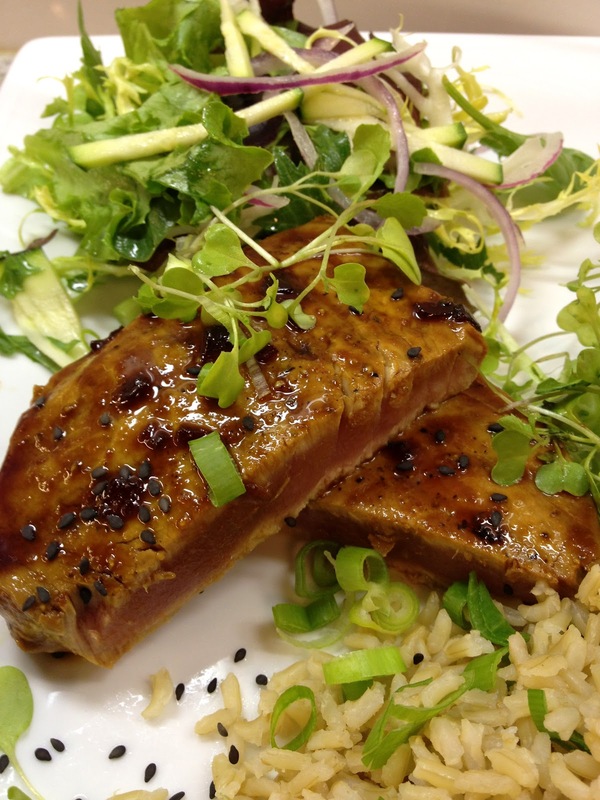 You may put all the tuna slices on an a large platter over your chosen garnish (I like a simple salad with thinly sliced onion and julienned raw zucchini), or you can certainly plate individually as shown above. I chose to slice each Steak in half before serving, rather than to serve in strips. Creative license is welcomed! Anyone who knows me would agree that I'm a major spicy food hound. While my main obsession is hot sauce, I actually like all types of spices - anything that adds flavor complexity or an extra kick is welcomed by me. 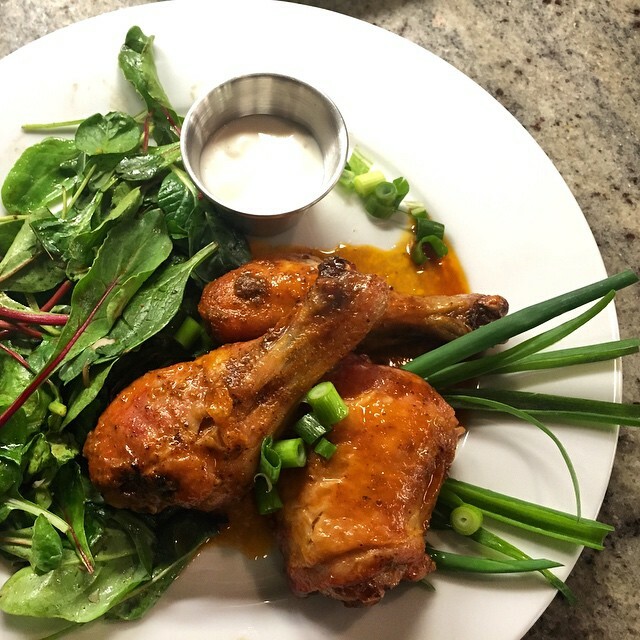 Our recipe calls for baked wings making them slightly lighter, while letting the wings sit in spices overnight helps infuse flavor. These will be a hit with your friends and family, and as you might expect, they are sure way to any man's heart. My husband gobbled these up in no time oohing and ahhing all the way through. Men sure can be simple creatures, in a good way, and sometimes keeping food simple is the way to go. 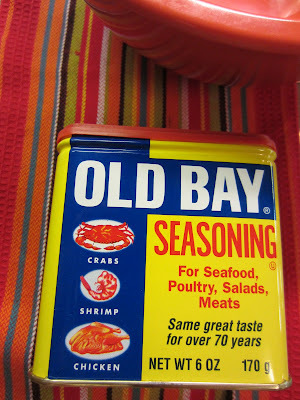 In a bowl, mix together Old Bay, Baking Powder, and Salt. Pat the Chicken Wings dry and place Wings in a large bowl. Sprinkle in the Old Bay mixture and toss to evenly coat. Lay the wings on a wire rack leaving space in between them. Place the rack on top of a foil lined baking sheet. Place the baking sheet and rack into the oven and cook until browned and crisp. 35 to 45 minutes. In a large bowl, combine Butter, Hot Sauce and Worcestershire. Mix. Add Wings to the bowl and toss thoroughly to coat with sauce. 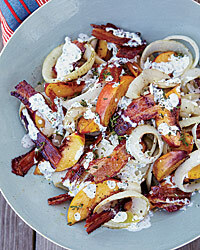 Serve immediately with a beer and lots of napkins! and it's not just about the cucumber any more. Today's pickling inspiration came from these beautiful red pearl onions. I recently visited The Tipsy Parson, a Southern-inflected restaurant in Chelsea, where pickled pearl onions served as a component in a very good savory watermelon salad. The visual contrast between the red watermelon and the purplish little onions was wonderful, as was and the unexpected pop of vinegary taste they added. Sure enough, upon further research, I found out that master chef Thomas Keller had an easy recipe for pickling these lovelies. I've reproduced Keller's recipe below making no changes to it at all. I mean, he's Thomas Keller. 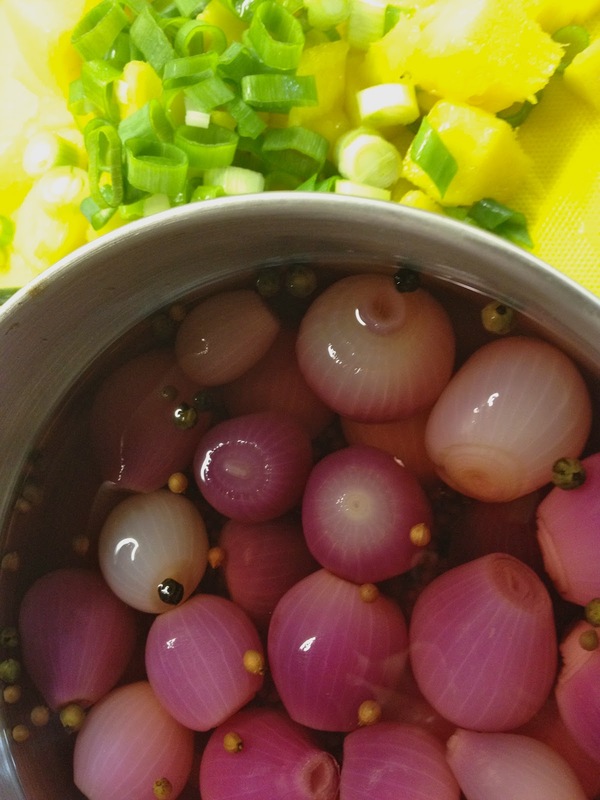 Keller uses his Pickled Pearl Onions as an accompaniment to grilled chicken, but I'll be doing something a little different. In a medium saucepan of boiling salted water, cook the onions until just tender, about 8 minutes. Drain, rinse under cold water, and drain again. Meanwhile, in another medium sauce pan, bring the 1/2 Cup Water are Vinegar to a boil along with the Sugar, Mustard Seeds, Coriander Seeds and Peppercorns. Continue to boil until Sugar is dissolved, about 2 minutes. Pour the liquid over the Onions and let sit in the refrigerator for at least an hour or up to 2 days. Drain before serving. 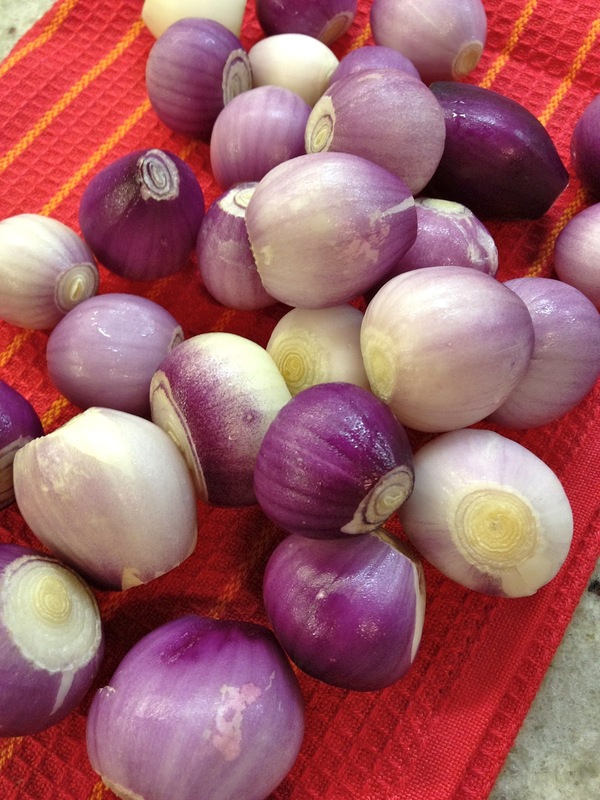 * Drained Onions can also be stored in the refrigerator for up to 2 weeks. 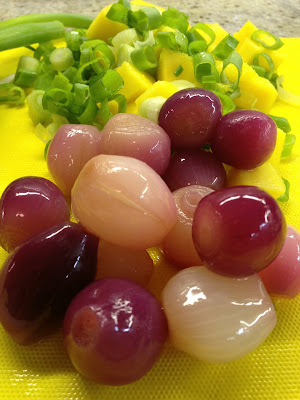 Cut Pearl Onions in half. Toss all ingredients in a bowl and mix to combine. Uses: This Salsa is great over a firm white fish or white meat, such as pork or chicken. Now my BBQ assignment was to come up with a great starter, and Ceviche was the first thing that popped to mind. Ever since our honeymoon in Belize, my husband and I have been partial to serving ceviches with tortilla chips just as they do there. 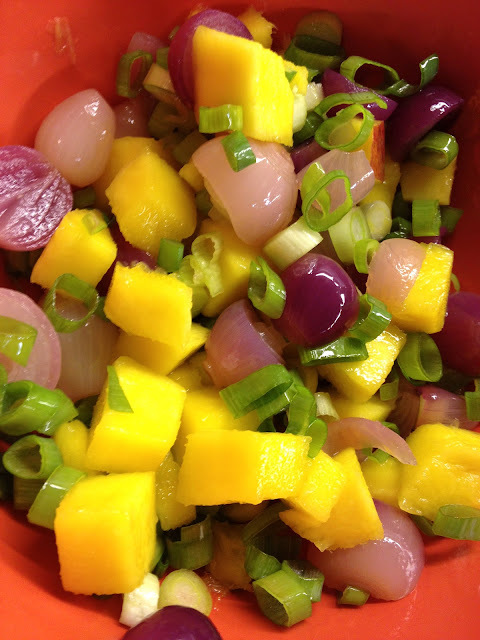 Ceviche served this way makes a great communal appetizer. 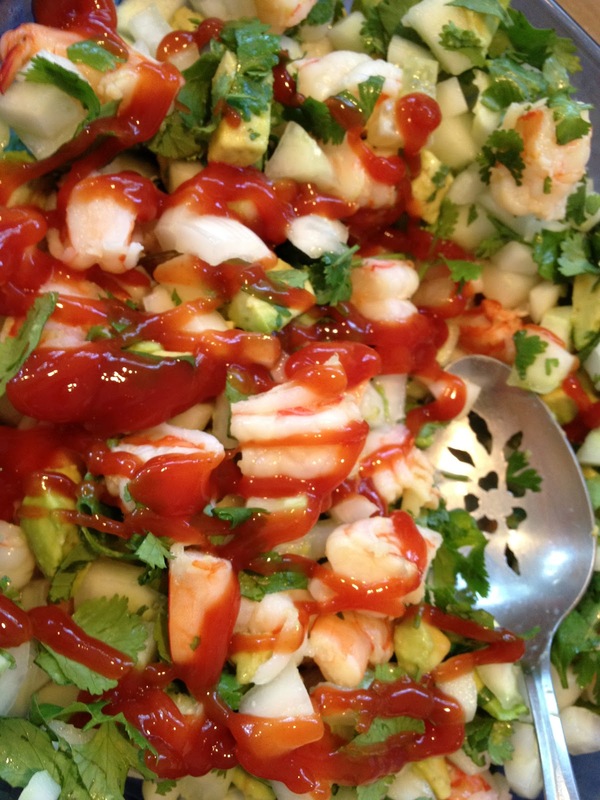 Best of all, the Rick Bayless Ceviche recipe that I adapted below calls for the shrimp to be cooked, unlike most ceviches which call for raw fish. Don't get me wrong, I absolutely love raw fish ceviches, but when serving a crowd and especially in hot weather, I often err on the side of caution with uncooked ingredients - it's the neurotic in me. Do enjoy this really easy, super citrusy and stupendous Shrimp Ceviche. We sure did! 1 1/4 Lb Shrimp, Peeled, Deveined, Tails off. I prefer smaller sized shrimp -35 count/lb. Bring one quart of salted water to a boil. Add 2 Tablespoons Lime Juice. Scoop in the Shrimp and cover until water returns to a boil. Immediately remove pot from the heat. Pour off the water leaving the Shrimp in the pot. Return lid to pot and let Shrimp steam for 8 to 10 minutes. Once steamed, lay the Shrimp in a large glass, high-sided dish to cool completely. Once cooled, remove Shrimp to cutting board and cut into thirds or bite-sized hunks. Return Shrimp to the glass pyrex and pour 2/3 Cup Lime Juice over them. Cover the dish and refrigerate for about an hour. Combine Onion, Chopped Cilantro, Avocado and Cucumber in a large bowl. Pour in the Shrimp with its Lime Juice. Add Ketchup, Hot Sauce, and Olive Oil. Mix gently until the wet ingredients are fully incorporated. Taste for seasoning and add Coarse Salt if needed. You may serve the Ceviche individually in Sundae bowls with Tortilla Chips on the side for a more formal gathering, but I opted to pour the Ceviche into a communal bowl set on a tray with the Tortilla Chips around it. Garnish the dish with lots of Lime wedges and a few Cilantro sprigs. Add a spoon in case folks would like to spoon on the mixture instead of dip the Tortilla Chips.